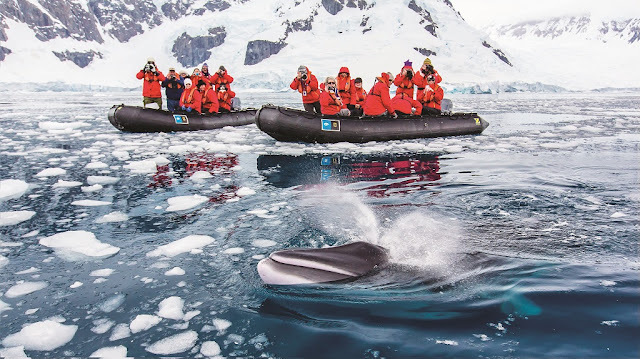 Antarctica offers the marvels of this world of penguins in astounding numbers, myriad bird species, and whales; the majestic ice sculptures, and the startlingly, hauntingly beautiful vastness. And, the utter absence of humans, or the man-made. Kayak among icebergs, enjoy cross country skiing and snowshoeing, Zodiac cruises, and hikes on the continent. There is, literally, nothing like Antarctica anywhere on the planet. Powerful reasons to go, even before the threat of climate change loomed. See the human face of the region in the Falklands, reminiscent of Great Britain, with grazing sheep, and tea with the hardy islanders at their farms. Walk in the freshest air in the world, across the most graceful topography, and in this privileged place, the albatross reveal the beauty of their mysterious lives.